My family went through a crisis recently. And I noticed that it affected each family member differently. Some of us got very emotional. Some withdrew into themselves. Others seemed busier than ever. In the midst of it all, my sister – an avid reader – revealed that she was re-reading The Lord of the Rings trilogy. She then went on to say that she did this every two years or so, whenever she got really stressed. Apparently, she finds it soothing. But my sister’s comment got me thinking. We do all have our own ways to escape when we’re feeling tired or stressed or over-extended. On her terrific blog, The Happiness Project, Gretchen Rubin talks about creating “a place of refuge.” By which she means a literal space – for her, it’s often libraries – that can serve as a peaceful refuge for her thoughts. But you don’t actually need to go somewhere to find solace, as my sister’s Lord of the Rings habit reminds us. My husband listens to music on headphones or watches concert videos. I just spent two hours with a friend whose husband did nothing but garden the entire time I was there. To me it looked exhausting, dirty and nerve-wracking, but he was clearly completely zoned out. How about you? How do you unwind? And where do you go? And speaking of literary escapes, via the Practicing Writing blog, I came across this list of obscure literary terms. Fun stuff!! 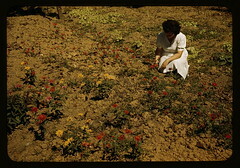 Image: Woman in her Garden, Virgin Islands? via Flickr under a Creative Commons license.